All the fun of the Fair is wrapped up in this mini cushion design featuring Carousel Horses surrounded by carnival colour and pattern. A large palette of rainbow colours have been used making this design enjoyable and interesting to stitch. This mini cushion would make a lovely addition to a child's bedroom, or to add colour and fun to your own decor. Only whole cross stitch is required, with a little backstitching needed for a few of the finer details. 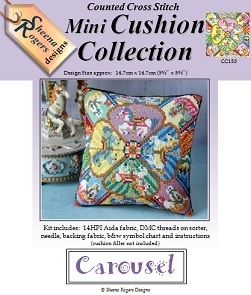 This mini cushion cross stitch kit includes: 14HPI white aida fabric, ready-sorted DMC stranded cottons on a card sorter, needle, backing fabric, b&w symbol chart and full instructions (cushion filler not included).